Made from 4130 steel, the airframe is oxy-acetylene welded assuring complete welds with FULL penetration. Wing ribs are factory completed and ready to slide on extruded aluminium I beam spars. Drag and compression members are square aluminium, making one of the strongest wing structures in the light plane field. Streamline struts increase performance and improve appearance. Enhanced manoeuvrability and superb short field performance is assured with the independent flaps and ailerons. 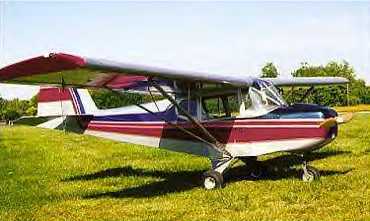 The 40 inch wide enclosed cockpit has dual controls, an easy access baggage compartment, 10 gallon fuel tank and pre-sewn slip covers are standard. Many options for customizing are available including skis and floats. A folding wing with full span aileron control is also an option. Recommended power plant should be 52 to 80 HP. Fully approved as a kit aircraft by the FAA.